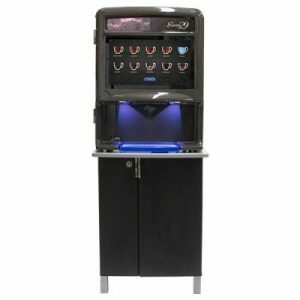 Percasso Coffee & Bottled Water service is proud to offer the latest in bean to cup coffee brewers for the office, the Encore 29 from Cafection. Cafection has taken the best features from the Total 1 machine, and put them in a smaller and more attractive machine that looks impressive in any office setting. Drink selections are made using an 18.5” high definition touch screen. There are three whole bean coffee hoppers which allows you to offer two regular coffees and a decaf, or even three regular options. The icons indicate the ingredients that make up each of the drinks which can be customized to your individual taste. Ghirardelli premium hot cocoa is used for hot chocolates and mochas, and we use David Rio Tiger Spice Chai as an additional option for the non-coffee drinkers in the office. Now you can have a mocha, latte, or iced coffee that rivals the cafe down the street without having to leave the office! At Percasso, we like to think we are different than other office coffee distributors, we listen to you! Contact us today to learn more about the Encore 29 and other ways Percasso can improve your break room.